Dr. Salek and his team will be providing comprehensive oral healthcare to people from all walks of life, with a special focus on providing comprehensive services under a single roof. Dr. Salek’s expertise is largely focused on treating oral pain resulting from a wide variety of causes. Mirhamid Salek, D.D.S. has stepped into the position of lead dentist at West Covina’s A-Z Dental Care. Dr. Salek will be focusing on providing truly comprehensive dental services under a single roof to members of the community of all ages and from all walks of life, says A-Z Dental Care. Dr. Salek’s expertise is largely focused on treating oral pain resulting from a wide variety of causes. The office adds that services provided will range from treatment of orofacial pain to routine teeth cleaning and check-ups to restorative procedures, root canals, dental implants, dentures, treatment for TMJ (temporomandibular joint) problems, and more. Dr. Salek employs state of the art imaging technology to find the source of complaints, including pain that doesn’t appear to have a clear cause at first, says A-Z Dental Care. In these cases, the doctor will often employ a CT scan – a type of imaging which can produce a far more complete view than is possible with standard x-rays. Armed with detailed information about the condition of the patient’s teeth and mouth, Dr. Salek will be able to provide an effective course of treatment, says the office. As an expert in dental pain, Dr. Salek is also able to keep patients discomfort during procedures to a minimum. The office notes that most patients experience at least some concern before having dental work, and he does everything possible to put patients at ease before, during, and after procedures. Finally, Dr. Salek and its business staff are committed to making care affordable for families and individuals from all economic strata, says the office. For budget conscious patients, A-Z Dental Care is in network with the majority of dental insurance providers. For those without dental coverage, it offers access to financing options and a personalized membership program which provides a 15 to 20 percent discount. Dr. Salek welcomes Denti-Cal (Medi-Cal) patients who may want to take advantage of recent expansions of coverage. 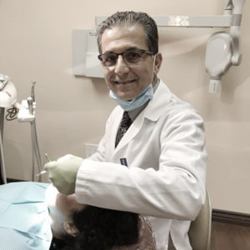 With over 25 years of background in dentistry, Dr. Salek’s training includes a degree in Orofacial Pain and Oral Medicine from the University of Southern California (USC). Holding numerous awards and certifications, Dr. Salek is board certified as a diplomate of the American Board of Orofacial Pain.